Donate as a partner to feed children in the slums of Nairobi! 100% of all public donations goes to buy food! There are more than 1 million people living in the slums of Nairobi Kenya, most within a 1.5 mile radius. Roughly 50% of those living in the slums are under the age of 15. Malnutrition, one of the leading causes of death in the slums, takes the lives of more than 20% of children before their 5th birthday. But because of our commitment to making sure 100% of public donations are used to purchase food, No Hungry Children is able to provide 10 nutritious meals per week for just one dollar while the children attend school!! 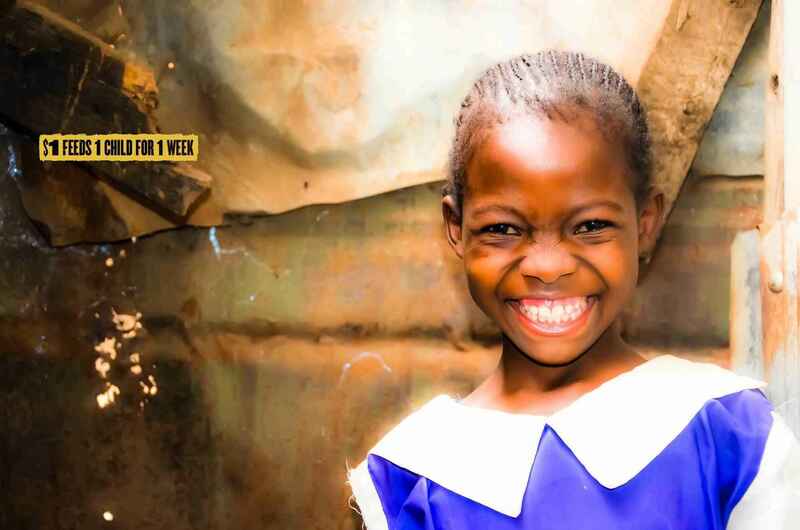 Yes…$1 feeds 1 child for 1 week!! The result…school attendance rapidly increasing and children being fed physically, mentally, emotionally and spiritually for the glory of God. These are joy-filled children who are incredibly grateful and eager to learn about the love of God as a free gift of salvation through Jesus Christ. We rely on regular monthly gifts from generous and blessed partners like you, to help in this cause of feeding children in Body, Mind, Soul and Spirit. Thank you for your generosity! God has created us all in His image. Hence helping His creation is helping God Himself! I hope He forgives my sins and blesses us all. Amen. Feeding hungry children. Is it even possible to say no? You reap what you sow. All the glory to Jesus Christ! We are Breath of Life Ministries located in Scottsville Ky. We are friends to Maurice and this offering is from donations taken while he was visiting. God’s love shall shine over these blessed children. Thank you for all that you do.